D /ARK is a dynamic 360º brand strategy and development agency, specialising in cross platform marketing and communication, both traditional and digital, to optimise consumer awareness and sales. The agency’s team expertise lies in wholesale, strategic communication, events, product development, pricing, global brand positioning, distribution, online marketing and amplified end consumer perception. 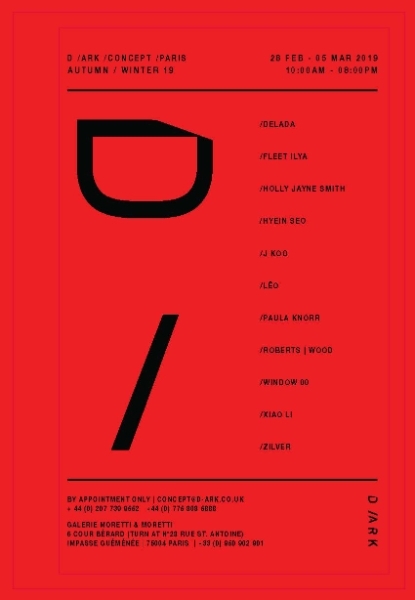 D /ARK /CONCEPT, launched in January 2016, is a unique Paris showroom and installation space of selected designer brands crossing over both menswear and womenswear and curating individual spaces, alongside D /ARK's curated areas.